The new American Honey Queen and Princess were selected at the 2016 American Beekeeping Federation Convention in Jacksonville, Florida. Congratulations ladies! They will post interesting articles about bees and honey throughout their reign. Keep an eye out for the sweetest representatives in America! Honeybees and bumblebees are often confused for one another. Both types of bees are frequently seen outside visiting flowers, and their comparable appearances leave many people wondering what type of bee they have spotted. Fortunately, with a little information, anyone can quickly learn to tell the difference between honeybees and bumblebees. Honeybees and bumbles bees have some similar characteristics, but their differences make it easy to tell them apart. 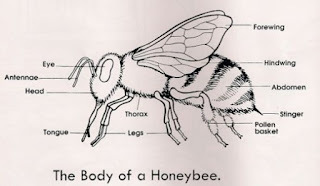 Both types of bees are insects and therefore have three main parts to their bodies; The parts are the head, thorax, and abdomen. In addition, both types of insects have four wings and six legs. 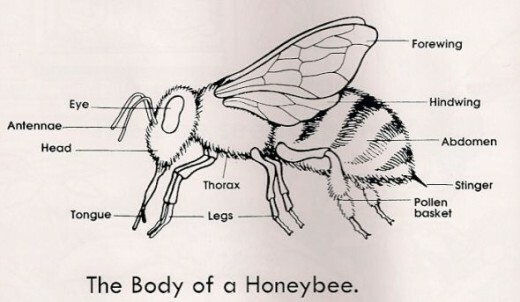 However, whereas honeybees have slim bodies, bumblebees have much thicker bodies. In addition, bumblebees have much more hair than honeybees. One of the easiest ways to tell a bumblebee from a honeybee is through color. Bumblebees often have black and yellow stripes covering their bodies, and honeybees show dark brown and golden brown stripes. Female honeybees and female bumblebees both have stingers they use for defense. In both groups, the male bees do not have stingers. Honeybee stingers have a barb on the end, and when a honeybee stings, the stinger gets stuck in her target. When she flies away, the stinger, along with her intestines, get ripped out of her body. She dies shortly after. For this reason, a honeybee can only sting once. The stinger of a bumblebee is slightly different because it is smooth. A bumblebee can sting without losing her stinger, and therefore can sting multiple times. 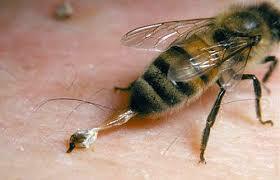 However, both types of bees are gentle and will not sting unless provoked. Both honeybees and bumblebees are social insects and have queen, drone, and worker bees. However, bumblebees live in groups of only about 50 to 400 bees, and honeybees live in a group of about 40,000 to 60,000 bees. Another difference occurs during the winter. 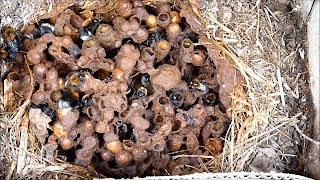 In a honeybee hive, the queen bee and many of her daughters live throughout the winter in the hive. They eat honey and flex their muscles to generate heat. 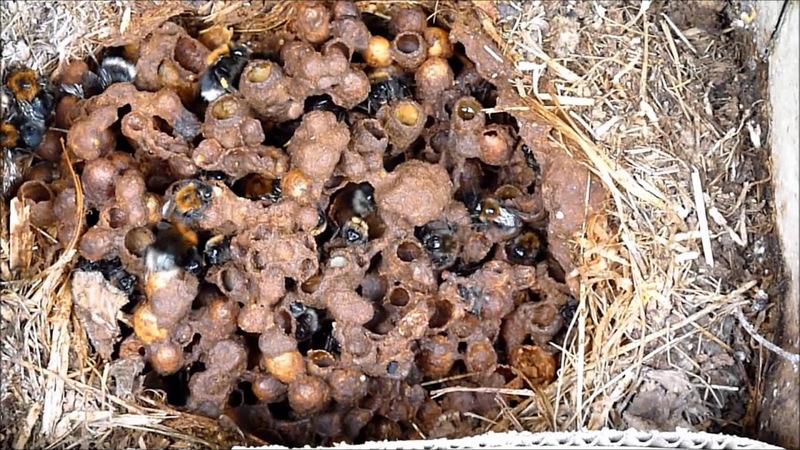 In contrast, only queen bumblebees survive through the winter, and they do so by hibernating in a hole in the ground. 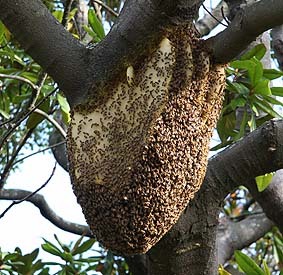 Honeybees create a surplus of honey that can be collected by beekeepers and sold. Bumblebees create only a small amount of a honey-like substance that is not collected by humans. Both types of bees gather the nectar used to make honey by visiting flowers. Honeybees prefer open flowers because they have short tongues. On the other hand, bumblebees have different lengths of tongues depending on their species and therefore feed on many different shapes of flowers. Honeybees and bumblebees are both gentle creatures with small, fuzzy bodies. They can easily be identified through their appearance, and have many differences in the ways they live their lives. Both honeybees and bumblebees are important for the environment and should be loved and appreciated for their work.